The THETA VECTOR ACTIVE GUITAR SYSTEM (TM) is the highest performance guitar system ever produced. The most powerful: 1100 WATTS RMS total power, the most flexible tone: dual amplifiers and dual front end pre-distort preamplifiers, the most gain: more than 140db, the most low end: 800 WATTS with dual active subwoofers, and the quietest with dual Decimator Noise Reduction Systems. The patent pending VECTOR ACTIVE GUITAR CABINET has bass on tap, designed as the perfect complement with maximum performance when used with the THETA HEAD. Years of experience in designing the highest performance Active Sound Reinforcement cabinets has allowed ISP Technologies engineers to develop the ultimate Active guitar cabinet. Description Simply connect the speaker output of the THETA HEAD to the input of the VECTOR like you would any other speaker cabinet and get ready to unleash the most unbelievable low-end punch and bass performance you’ve ever heard. The internal amplifier of the THETA head drives the two twelve inch guitar speakers directly and simultaneously delivers the input signal for the internal power amplifier that drives the internal active subwoofer. The subwoofer level is adjustable via the sub level control on the back of the VECTOR cabinet. The internal 400-WATT RMS Active 15-inch subwoofer delivers more deep, low end punch than any other guitar cabinet available. The VECTOR ACTIVE cabinet is high on innovation, incorporating novel Line Array geometry and the patent pending Dynamic Current Amplifier Technology “D-CAT” powering a 500-watt, 4-inch voice coil, 15” woofer. With two 12” guitar speakers in vertical Line Array geometry, ISP solves the problem of horizontal dispersion. Not only does a typical 4×12 guitar cabinet deliver poor bass response but the high frequency response also beams like a flashlight. Directly in front, your ears get shredded yet, move slightly off center and you lose all the high frequencies. The VECTOR cabinet solves this problem through use of Line Array geometry providing excellent off axis dispersion at the higher frequencies. The VECTOR Cabinet is flat all the way down to 50Hz delivering enough low-end bass to match the frequency response of any 7 string guitar. Tune down as far as you want and the VECTOR continues to perform. The VECTOR cabinet can also be used with any existing amplifier. To all this performance add three-way power amplifier protection and you have the most reliable active guitar system ever made. The VECTOR’s internal D-CAT amplifier has global thermal protection, thermal protection built in the power transformer, and an on board distortion limiter circuit to eliminate the possibility of feeding square waves to the woofer. This means that, as long and hard as you drive the VECTOR, even to its maximum limits, you never have to worry about failures. Whether you use the THETA head or your existing guitar amplifier the VECTOR delivers a level of performance never before available. 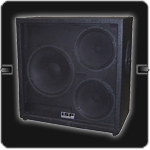 Features 2×12 with 15-inch active 400 Watt RMS subwoofer. This can be used with any head, but optimized for use with the THETA Preamplifier. Casters included for convenient transportation. – Weight – 120 lbs. © ISP Technologies. All Rights Reserved.